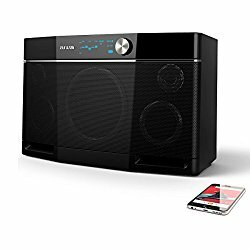 Aiwa Exos-9 Portable Bluetooth speaker is a stylish and exceptional speaker for people who are looking for a great entertaining portable speaker. Aiwa is one of the best leading brands when it comes to technology, sound and music. In recent times, it has been gaining tremendous popularity because of its high quality and affordable products. The brand keeps investigating latest technologies to develop products that are more functional, Hi-tech and affordable for the users. There is no doubt that "Aiwa Exos-9 Portable Bluetooth speaker" is another excellent product from the company. As the name suggests, this is a Hi-FI Bluetooth Wireless Speaker that you can use for smartphones and devices that are compatible with high-end bluetooth speakers. The speaker has an innovative and stylish design. The design of this speaker can attract every onlooker and passser by. The speaker features latest and advanced Bluetooth technology to deliver extra sharp sound while consuming less energy. You can take calls on your smartphone and enjoy good sound quality. The device features a built-in battery. Thus, it can provide you with up to 8 hours of playtime without any interruptions. In addition to this, the metal shell surrounding the stylish body keeps the speaker safe during falls. Overall, Aiwa Exos-9 Portable Bluetooth speaker has an appealing design, innovative features and offers exceptional sound quality. If you have been looking for a Hi-Fi Bluetooth Wireless Speaker for your smartphones and other devices, you would not get anything better than this. It is one of the best bluetooth speakers available in the market. Its low price makes it even more special. For more details about this speaker you can check Aiwa Exos-9 review here online. This will help you make your best buying decision.